The mini kiwi is like the name suggests, a relative of the kiwi we know from the supermarket. 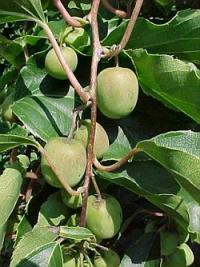 The mini kiwi (Actinidia arguta) is a climbing plant that is completely hardy in contrast to the ordinary kiwi. Great for our climate, therefore, as an original and tasty hedge plant. You would dare to suspect that the mini kiwi is a commercial-grown variant, but nothing is less true!It is a very old species, which already existed in the Tertiary vegetation. The mini kiwi originates in northern Japan and the Taiga’s of Siberia but was soon cultivated in Europe and Asia. There are therefore many different names known; Siberian gooseberry, kiwiberry, baby kiwi, grape kiwi, cocktail kiwi, hardy kiwi, kiwai, tara vine, bower vine, kishmish and kokuwa. 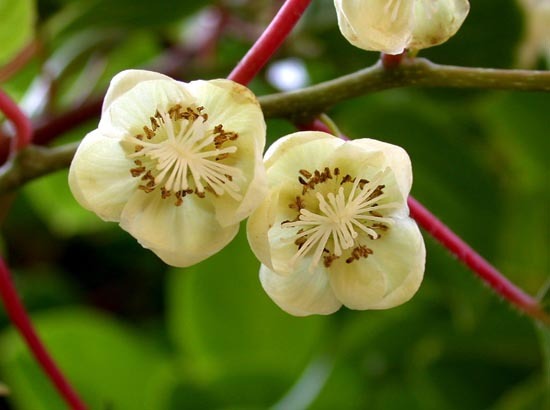 As a climbing plant, the mini kiwi naturally grows through other trees to height of 15 m. The male and female flowers are located in separate plants, so a male and female plant is needed for fruit formation! However, for pollination it is not necessary that the male and female plants are of the same species. For example, a male ordinary kiwi can pollinate a female mini kiwi. 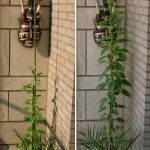 The mini kiwi is a fast grower as you can see on this picture. The pictures are taken with 40 days interval. As mentioned earlier, the mini kiwi is completely hardy; Some varieties even down to -30ºC (-22°F). As it isn’t wintergreen, the plant looses its leaves in fall. After 2 to 3 years the plant will have its first flowers. 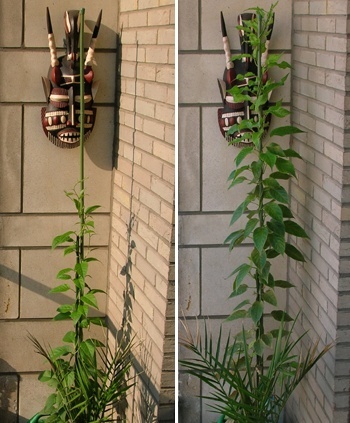 Only then, you can tell with certainty whether you have a monoicous or a dioicous plant. The plant blooms in the may with small white flowers. If pollination is successful, fruits will be formed. These ripen faster than the ordinary kiwi, which allows you to harvest edible fruits in octobre even with our short summers. The fruits, which will remind you of white grapes, have a bare peel and can been eaten with this peel. Cut in halve you will see a miniature version of the ordinary kiwi and the taste is also the same as his big brother. You can eat them just like that or make preserves out of it. The sliced ​​fruit is an original garnish for salads or desserts. It has never become really populair in our supermarkets, probably due to labor-intensive harvesting of the small fruit. But sometimes you’ll find the mini kiwi in the store. Those are generally grown in Chile. The Actinidia arguta ‘Issai’ is a Japanese cultivar originated from a crossbreed. Unlike most other cultivars, the Issai is monoicous and therefore self-pollinating. The growth is less strong than the other varieties, making the Issai also very suitable for smaller gardens. This species has less fruit than the other varieties. Hardiness is also a little less than the other species. The fruits, on the other hand, ripe quicker and earlier; in september. The Issai is generally found in garden centers. Ken’s Red, suitable for fruit transportations. Red Princess, fruits are green-red colored on the inside. Nostino, male species for pollination of other species. Gibrida M, male species for pollination of other species.